“Sometimes people make fun of me for all the pictures I want to take. Friends and family will groan and say, ‘Not another picture!’ But I know the short amount of discomfort will be worth it to capture the moment. “When I look back at these pictures, they make me smile — and I hope the same can be said for this picture of kindness. My 3-year-old daughter, Alaina, and I were grocery shopping. We try and get our big shopping runs in when her two older sisters are in school. “We usually have a pretty good time at the grocery store loading the cart up, people-watching and talking about all sorts of random things, like ‘What is your favorite flavor yogurt?’ (Orange Dreamsicle) or ‘Smell this green stuff. Who in our family likes to eat this?’ (Cilantro — and only Mom). “I politely asked the couple if I could take their picture. The wife looked a bit caught off guard and hesitant, but agreed. 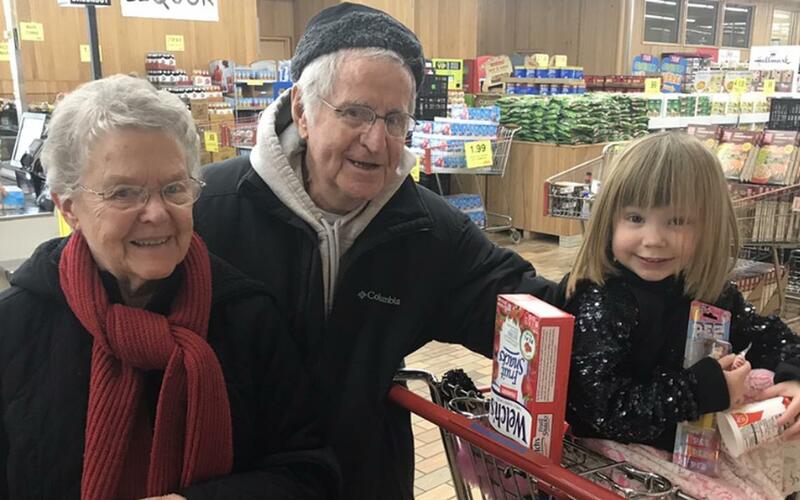 “This is the third time we have run into exceptionally kind people at the grocery store. Once, it was a gentlemen who ‘found’ silver dollars behind my daughters’ ears. Since it was magic, he let them keep the coins.